As a member of the Happy Blogger team, I was asked to check out the July Activity kit from Green Kid Crafts. A monthly subscription service, Green Kid Crafts will send you an activity box each month to explore with your 3-8 year old! We are about half-way through summer here and with an unusual amount of rain, we have definitely been needing some activities that bring the outdoors inside for a bit. We received the “Backyard Science” box which included 4 different projects using either the items they supplied or common household items and those found in nature. I was really impressed with how everything needed for the craft truly is included in the box. They even sent us a pair of scissors! And not just that, Green Kid Crafts even included the shipping box in the projects so there is very little waste when all is said and done. Oscar and I decided to make the leaf pendant first, which came with clay to mold the pendant, a mixing cup with a q-tip for stirring and painting and earth (and child) friendly paint powder. Oscar loved stirring the powder and water together to make paint while I worked the clay a bit. 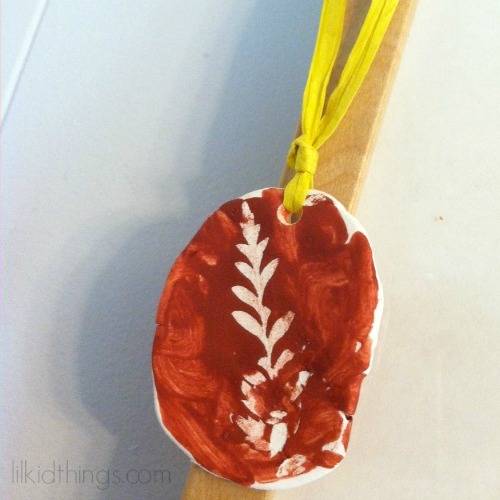 We molded our pendant and placed the included leaf in the clay. On our first try, we had a bit too much paint so when we peeled the leaf off, you couldn’t see the stencil at all. No worries though because we just flipped it over and did it again! In fact, there was enough clay and paint to make two pendants if we wanted to. But we decided to save it for a future project. Once completely dry and hardened (a couple days later), Oscar was able to thread the raffia through and I tied it to make this cool pendant! It currently hangs in the kitchen. What I love about this activity box is the fact that I don’t have to think about what craft to make and then rummage around to find the 3 or 4 items I might need. It’s hard for me to find a craft that interests Oscar and I am tired of spending a bunch of money on supplies that he only uses once. With the Green Kid Craft box, we get to make something cool and move on to something else. Love it! If you love the start to finish planning and execution of a craft idea, then you might find that Green Kid Craft boxes aren’t worth it. But for others who love the convenience of opening the box and getting started with a craft right away, this is a great product. Subscriptions can be purchased anywhere from month-to-month to a 12 month subscription. Monthly prices start at $19.95. 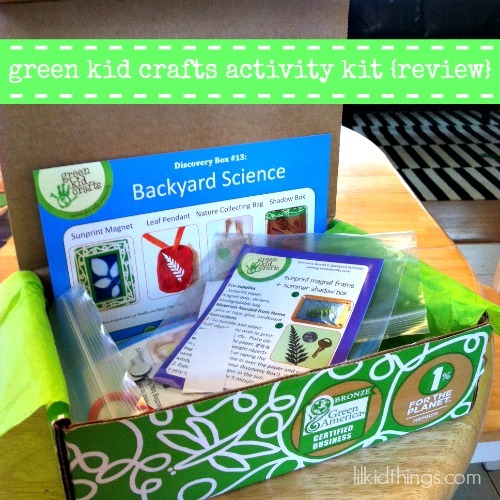 Check out Green Kid Crafts to learn more and check out other samples from prior boxes. You can also keep up with the latest by following Green Kid Crafts on Twitter, Facebook, and Pinterest. Disclosure: I received the Backyard Science activity box for the purpose of facilitating this review. All opinions are my own. Cool Character Shoes by Etnies: Monsters University!